Pacquiao right on the onset of the first round after measuring Bradley projected a boxer who was on a mission, that was, looking for a knockout in the early rounds of the fight. What motivated him was known only to him. But it was obviously evident that he wanted to knockout Bradley and cement a legacy that will put him into the pedestal of greatness as this was his last fight as he convinced himself that it was so. He was carrying the fight as the aggressor as Bradley moved back and around the ring with Pacquiao in pursuit. The crowd of more than 14,600 excited boxing fans in attendance at MGM Grand Garden Arena in Las Vegas this time around was given their money's worth including millions watching pay-per-view at home. 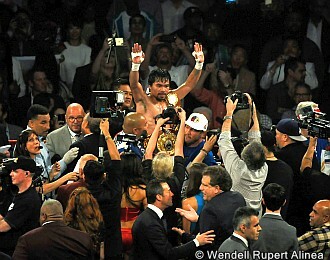 Pacquiao can again hold his head high after an unforgettable and disappointing loss to Mayweather last year. He has proven that he still has it. The greatness in him. He can fight toe to toe when the need calls for it and he can outbox his opponent and more so put him in the canvas and in this case put Bradley twice in the canvas, first in the 7th round and second in the 9th round, although, lacking the killing instincts that he is well known for in his early fights.”I am trying to be careful,” Pacquiao said. There was time in the 8th round that Bradley held his ground and put an arsenal of combinations but this did not deter nor hurt Pacquiao who even urged Bradley to throw more punches. Pacquiao won unanimously with a score of 116-110 from all three judges and embraced the WBO International Welterweight belt in the process. Pacquiao's maybe last hurrah is something to be proud of as he is entering a new ring of challenge. This time in a more broader scale and a more challenging endeavor. This time he will not be throwing punches but lending and extending his hands in serving the Filipino people. Not only in Gensan, not only in Sarangani as a congressman but in the entire nation as he is vying for one of the Senate seats in the Philippine government. He will not be knocking down opponents but instead raising up people's hopes and aspirations. For he is pure in heart as Jesus is his saviour, not corrupted and hope never will. Pacquiao retires from boxing with a bang with a not so perfect record of 58 Wins (38 by knockouts), 6 losses and 2 draws but still too good for the Boxing Hall of Fame and yet he retires for the Filipino people.